There's something about the plaid shirt that has turned the quintessential 90s grunge piece into a chic addition to the modern wardrobe. It's quickly become a fun pattern to incorporate into print mixing and it has been updated with studs and spikes (like this Zara shirt) or made chic by pairing with unexpected items (like sequin skirts). I was pretty tomboy-ish in the way I dressed as a kid so I definitely owned a plaid shirt or two. I loved wearing it as a layer to my t-shirt or tied around my waist. 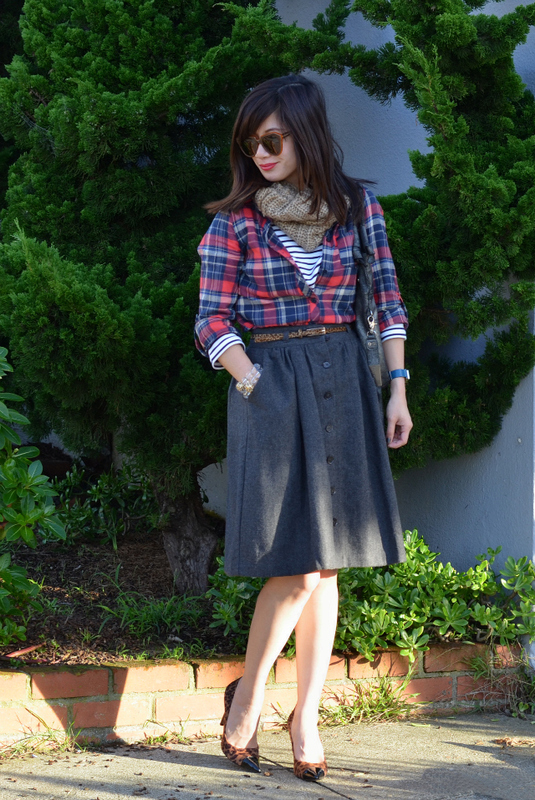 For this look, I layered my plaid shirt with my stripe shirt underneath and paired that with my ladylike thrifted wool skirt. Of course, I threw in some leopard for good measure (belt and shoes). Ya know...in case there wasn't enough print mixing going on. It's an eclectic mix of vintage, grunge and ladylike chic (so it seems). Tis the Season! I always love plaid, it's my favourite pattern for fall/winter. Great mix of prints!! You look very pretty and elegant! I really love plaid shirts like this, especially when paired with warm accessories like that scarf! Just looks so cozy! 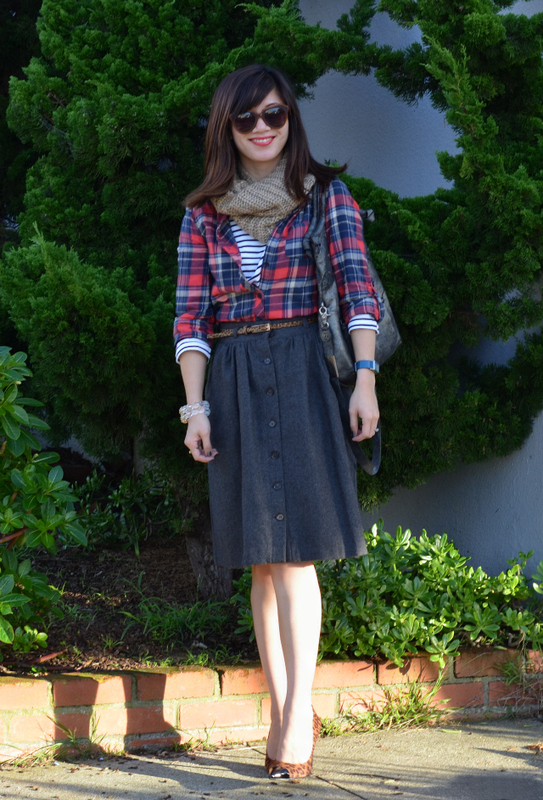 I love the pairing of the plaid and skirt! you look great. Love love the print mixing! Such a big fan of plaid right now. I might be going overboard lol. I really like it how you've spiced the plaids with leopard heels ! Such a cute look. And the skirt looks perfect too, nice shape and length. :) Cute look! I love that you have the leopard on your feet. I love that skirt! This outfit totally works, If i just read the description I would think no way, but it really looks great! Good job. So cute! Love the plaid shirt and leopard heels! love this look on you – it's sort of updated boho ladylike, if that makes any sense at all. Love the print mixing! I don't really think about layering plaid shirts but it looks great! Love this chic and stylish look! Thanks for stopping by my blog girl! i have been living in my plaids and flannels lately! i love seeing them paired with feminine pieces like your skirt here. You've certainly taken the plaid shirt to another level. I've always liken the print to more grungy, rocker type style but your outfit is unbelievably feminine. I adore the mix of prints, and those shoes are terrific! Cap toe and leopard? Heel perfection, I tell ya! Your whole outfit is so chic and you are glowing! nancy, that is a gorgeous plaid! not all plaids are equal. you picked a winner and styled it to perfection. you look exquisite! i love your accessories and skirt. 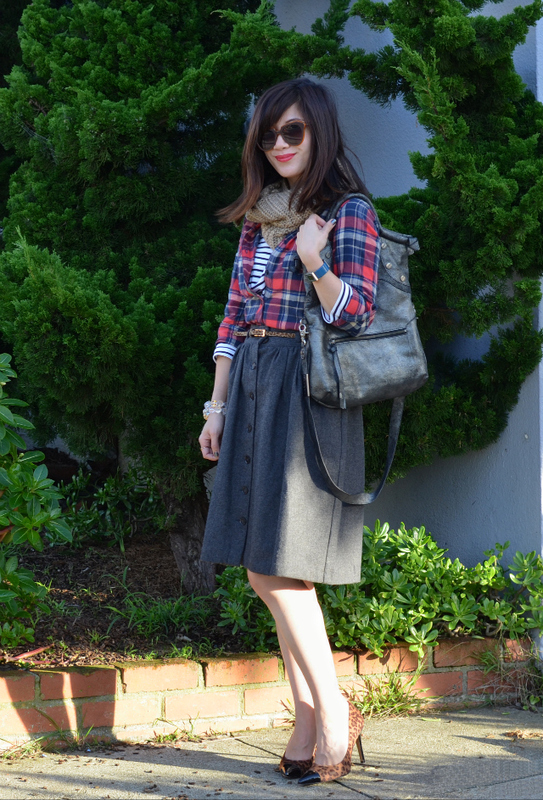 stripes, plaid, and leopard! I love it!! Looks perfectly pulled together! I am in love with this look! They were meant to be worn all together. so darling! I love the plaid with that skirt. And that skirt is such a perfect and versatile piece! Nancy, you rocked it on this one! Love this outfit so much. I'm very picky about pattern mixing, but this is by far my favorite of all of the ones that I've seen. I love every detail of this outfit!